Hex is a classic, well studied and widely admired game. The rules are trivial. 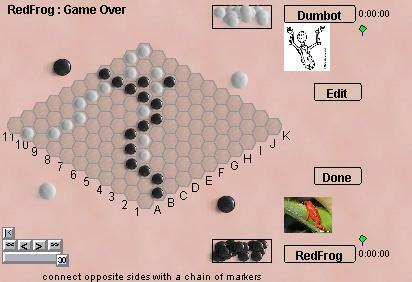 Just connect the opposite sides of the board with a chain of stones. The amazing and infuriating thing about hex is that direct strategies to connect do not work, so you are forced to consider indirect methods, which do not obviously lead anywhere. A lot more people have heard of Hex than have ever played it, which is too bad, because it's a really interesting game! Robots: Alas, the robot player for Hex is really, really dumb. This is primarily because hex is a pretty difficult problem for a computer. The back story: I chose Hex as an official "sample game" for developers who want to add their own games to Boardspace. It's a good game in it's own right of course, but it's also close to the simplest imaginable game to implement. The sources for Hex (which developers get from me) are heavily annotated to make them the best possible template for boardspace games.